The trip review here describes our journey from Martinique to Grenada, over two weeks in November 2017. An amazing two weeks with several "champagne sailing" moments. We hope you enjoy this trip summary. If you'd like to apply for upcoming Island Adventures, click below. 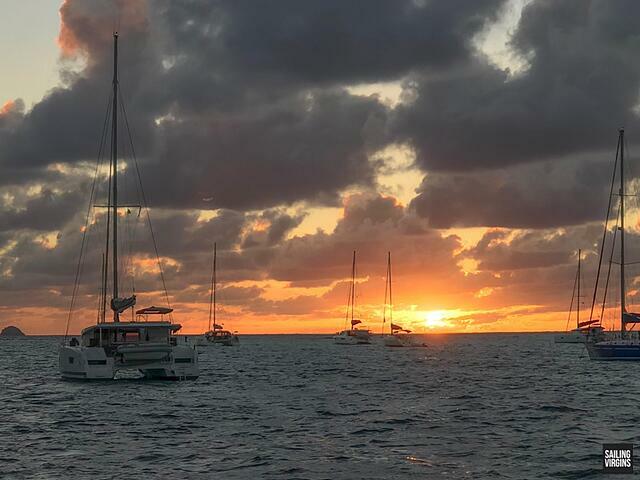 On Sunday November 12, five of us dropped the lines, raised the main and sailed out of Le Marin, in the southern part of Martinique, bound for Grenada. On board this first week were two Sailing Virgins instructors (Jack and James) and three students: Celine (France, 25 years old), Jordan (California, 28 years old) and Sarah (North Carolina, 28 years old). Celine was returning for more sailing and filming with us, while Jordan and Sarah were both first-timers. We sailed as the sun set, broad reaching for a couple of hours, passing the James-Bond-like Diamond Rock, then close reaching for an hour or so. Our first overnight stop was in the exceptionally lovely bay of Grande Anse, where we found a little bistro and tried a local dish called accra, which is a sort of fish fritter. The French influence is keenly felt here, where even this simple dish was raised to a sublime level. Gastronomy behind us, after a fairly rolly night on anchor we woke early, went to shore to load up on fresh French bread, then set sail, this time heading to a new country, St Lucia. The four hour sail across the channel was robust and fast, averaging 8 knots on a beam reach. Lovely. Coming into Rodney Bay, St Lucia, we managed to secure a spot at the marina, for a well deserved, very quiet night. Our morning routine consists of some Wim Hof breathing exercises (if you haven't heard of Wim Hof check this out; it is 40 minutes well spent) followed by meditation, then, when we can find the space, a 7 minute workout. A very holistic start to the day! Entirely voluntary, it was great to see everyone getting into this. Rodney Bay provides perfect conditions for alongside practice, so several hours were spent with Sarah, Celine and Jordan taking turns mastering their alongside techniques. 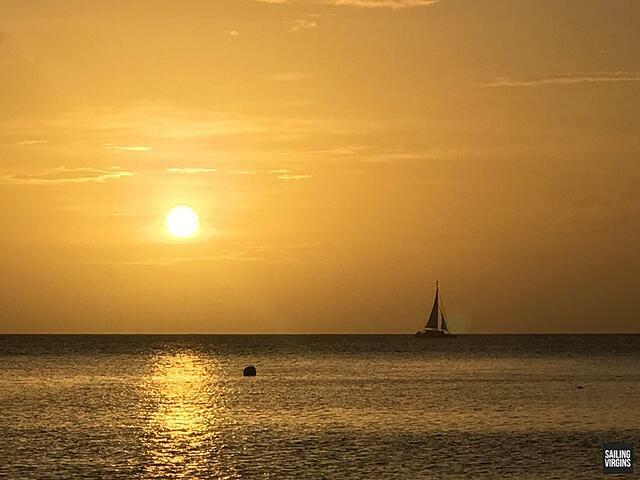 The sail following the morning drills was relatively short, through dusk, arriving in Marigot Bay just as the last light of the day was disappearing. We chanced upon an amazing resort with swimming pool, attached to the marina, and enjoyed the swim before having dinner on the boat. The next morning we decided to climb Grand Piton, one of the incredible volcanic plugs that dominates the west coast of St Lucia. It was an hour-long journey to the beginning of the walk, and a challenging four hour trek up to the top. It felt great mixing land with sea adventure. On the way back we stopped for a late lunch at the quirky, naturally beautiful bay of Soufrieres, visiting the friendliest artist in the Caribbean, Zaka, and procuring a few of his latest pieces. He then went for a fish off the wharf. We arrived back at the boat, ready to rest up before doing a night passage. 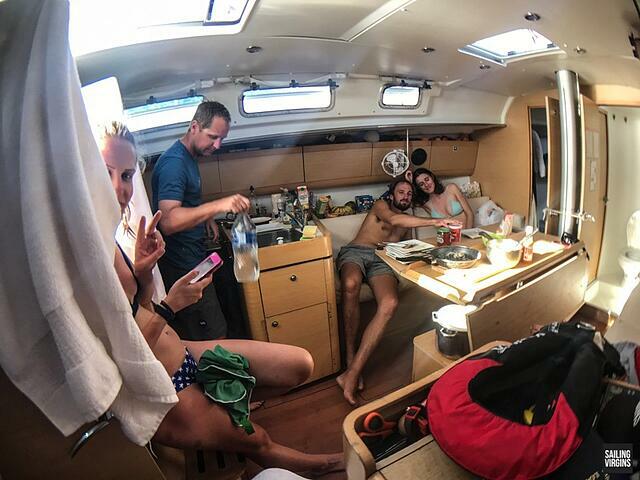 Asleep by 7pm, the first watch woke at 2am to begin the night passage to St Vincent. We sailed in close to perfect conditions, watching shooting stars as they wizzed across the sky, with wind ranging between 10-15 knots, on the beam, the boat happily sitting on 5-7 knots. We arrived into Chateaubelair in St Vincent at about 8am, just as we felt like eating breakfast. Night sails can be exhausting, so we were in for a fairly lazy day today. Customs and immigration took quite a while, and as happens in these parts, the Customs official offered to be our taxi driver to the waterfalls nearby. We spent a great few hours swimming under incredibly beautiful falls, making our way back to the boat and setting out to anchor in nearby Cumberland bay, enjoying a half hour of sun right on the nose of the boat as it set. Our anchoring was using a shore-line to our stern, eliminating swing. Tonight was spent enjoying mojitos and getting social with a boat that was anchored next to us. The next morning we practiced tacking and gybing, making our way to a surprisingly cool lunch spot ("best lunch spot ever" according to Jack) where we managed another anchor with shore line, until the wind shifted and we dropped the shore line and swung free. The afternoon was a sail to Bequia, where we were able to show Jordan a glimpse of the Grenadines before he left us to head back home. The next morning was Saturday, so we enjoyed a 2 hour reach/beat across to Calliaqua, then to True Blue marina, where we put Libertas alongside, gave her a clean, then headed to a place we had rented for the evening. It felt nice to have an evening on land after a solid week of being on the water! Our house in St Vincent was simple and comfortable. Washing was done, showers were enjoyed and we all ate together. A slackline was set up in the yard and we took turns over a beer, listening to some tunes as the sun set. JT joined us and immediately slotted into the spirit of the group. The next morning we met fellow student Alex at the marina and prepared Libertas to sail. Hugs all around as everyone said their goodbyes to Jordan, and we sailed across to Bequia. This week was a step up in sailing coaching. 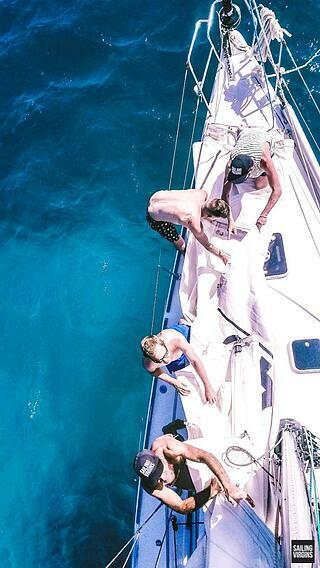 All four students had prior experience, with JT having come off skippering his own two week charter in the Grenadines. Jack and James adjusted their instruction, upping the sailing a notch or two out of the gate. Bequia is always a great place to stop. 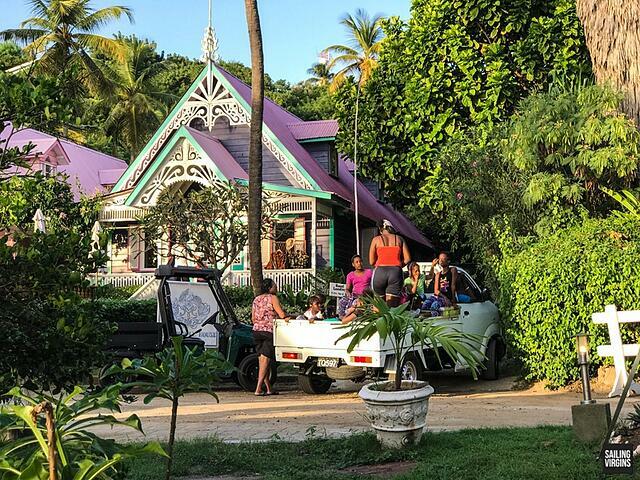 From there, with fresh Bequia fruit and vegetables on board, we did some mooring ball drills then sailed across to the billionaire's island of Mustique. Conditions gave us an opportunity for some beating, with a pretty brisk 18 knot true wind speed making for exhilarating beating conditions. Mustique has mooring balls, so after a swim with a couple of the resident turtles, we were able to refine the mooring ball drills further. A private island, with manicured lawns and an exceptionally good (and expensive) boulangerie, Mustique has its place in our adventure. The next morning Jack took everyone for some alongside drills, made more challenging by the swell and eddying breeze. Celine sailed us out of there, gybing beautifully in the bay in a light breeze. The sail to Canoan Island was directly downwind, so we played with wing on wing, then broad reaching, reefing, gybing, gybing, gybing some more until everyone pulled the move like a well greased winch. In Canoan we filled up with water, then spotted a rip in one of the top sliders in the main. With Bequia being the main sailmaking port in the Grenadines, we needed to decide whether to return to Bequia or sail on to Union. We elected to sail on to Union, arriving there just after sunset. Early the next day everyone helped get the mainsail off Libertas and take it into town in Clifton Bay. We found a local sailmaker in the smallest sailmaking loft in the Caribbean, and maybe the world. Jack took the students for more alongside drills while the sail was being repaired. When the sail was ready, JT and Alex prepared a passage plan to the notoriously difficult Tobago Cays. Given it was a night sail we were happy to augment the passage plan with electronics. The new day broke across the Tobago Cays. Immediately after the morning ritual everyone headed to the island famed for its turtles. 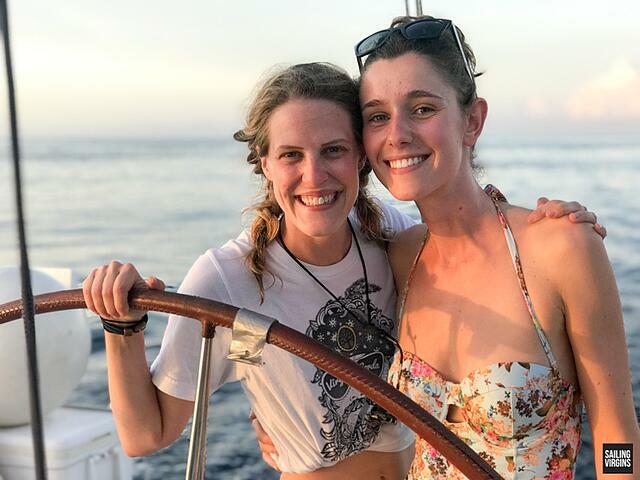 A great few hours was spent swimming with turtles and climbing the island, then Jack and James upped the passage planning ante, asking Alex, Celine, JT and Sarah to prepare one to sail back through the cays with all their foul areas, this time with no electronics. Careful navigation meant a very neat passage through the area, all done without any electronics. Given the students were responding to everything the instructors threw at them, after man overboard procedures were naile9d it was upped to non-engine man overboard recovery. Then, heading into Union to check out of the Grenadines, we all spent time picking up mooring balls under sail. A great skill that everyone managed to pick up. We sailed onto the island of Carriacou and checked in, just after Steve Jobs' family's boat Venus. We walked around the charming little town and enjoyed celebrating Thanksgiving with a sundowner and some beach sprints. That night was to be another night sail. 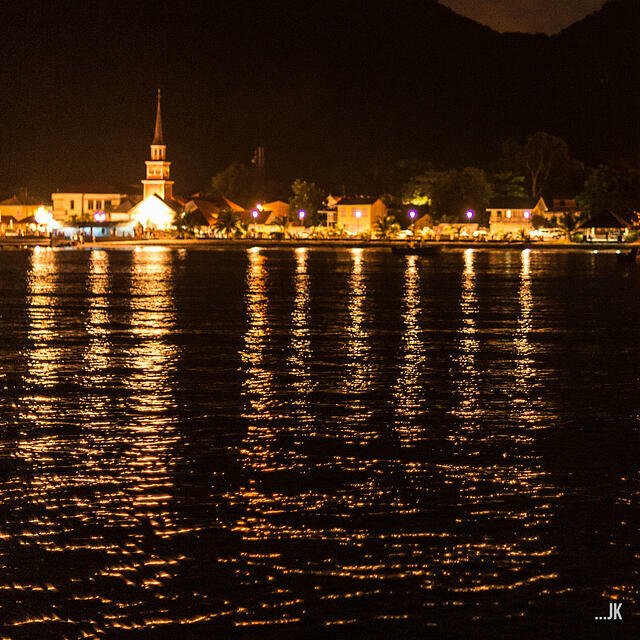 So after eating dinner at a local restaurant, we all went to sleep early, with Jack and the first watch getting the boat moving at about 2am. Another incredible night sail followed, as we sailed into Grenada, having a breakfast stop at the underwater sculptures just outside of St George's Harbour. An hour further, a little tour of St George's Harbour and we pulled into our slot at the marina. Two weeks of an incredible adventure! Sailing Virgins runs Island Adventures throughout the season. Entry is by application only. Students do not need prior experience, but they need youth (most are in their 20s and 30s), agility (the sailing can get pretty athletic), teamwork (you will meet some of the coolest people ever) and a keen sense of adventure. Click here if you would like to apply to join.